Summary Tri-band Wi-Fi system with dual-stream dual-band client connect and four-stream 5 GHz backhaul radio. Similar design to original NETGEAR Orbi. 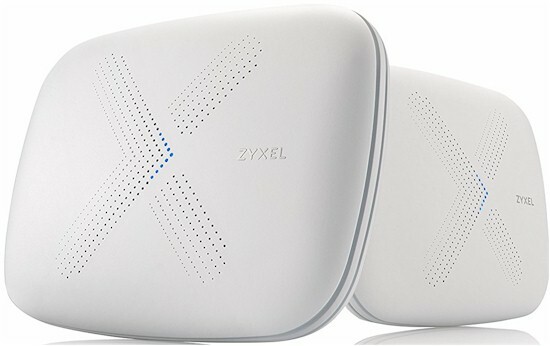 While we wait for the new mesh/distributed Wi-Fi systems introduced at CES 2018 by ASUS and D-Link to ship, I'm going to look at a product Zyxel released late last year into a market that is largely dominated by NETGEAR's Orbi on the high end and Google's Wi-Fi on the low. The Multy X AC3000 Tri-Band WiFi System is basically a copy of NETGEAR's original RBK50 AC3000 class Orbi. While other companies have come out with three radio "tri-band" Wi-Fi systems, Zyxel is the only one to copy Orbi's dedicated four-stream 5 GHz backhaul radio. Everyone else has stuck with two-stream backhaul. But Zyxel has made a key departure from the Orbi playbook in using only one hardware module vs. Orbi's dedicated router/satellite design. With its 9.3" x 7.0" x 2.0" (236 x 178 x 51.5 mm) footprint, Multy X has a footprint more like a conventional router than a typical Wi-Fi System node. Unlike Orbi, Multy X is designed to sit flat on a table or shelf. No brackets are provided to make it stand up and there are no mounting slots on the bottom for wall/ceiling mounting. There are four gigabit Ethernet ports (one for WAN, three for LAN), power port and USB 2.0 port on the rear. The USB port is inoperable at this point. Like most other Wi-Fi systems, there's a Bluetooth radio and iOS and Android apps for setup and management. There is no web GUI. There is one multicolor LED on the top that uses the colors and blink patterns described in the graphic below to indicate status. Zyxel still has the FCC photos under wraps for another month or so. So I opened one up after testing for a look. Heatsink plates cover the bottom and top of the board. The photo below shows the assembly removed from the case, with a clear view of all 9 antennas that I've identified with callouts. The next photo, with heatsinks and RF can tops removed, shows the two stream 2.4 and 5 GHz client facing radios provided by a Qualcomm IPQ4019 SoC. The dedicated four-stream 5 GHz backhaul radio (QCA9984) is at photo right. The bottom view shows the 512 MB of RAM. The table compares Multy X's key components against the RBK50 NETGEAR Orbi. The designs use the same components, except for the RF power amps and front ends. I wasn't able to pry off the RF can over the Bluetooth 4.1 radio. But I'm guessing it's the commonly used CSR8111. All performance tests were done with V1.00(ABKJ.3)C0 firmware and V1.4.1.171227 Android app using select tests from the Version 10 Router process. The iperf3 WAN to LAN and LAN to WAN throughput tests came in at 860 and 751 Mbps, respectively. Multy X results are highlighted in the charts below, showing it ranking in the lower third for WAN to LAN and smack in the middle for LAN to WAN. I'll be comparing Multy X with the original NETGEAR AC3000 Orbi from here on. WAN to LAN testing using the HTTP method benchmarks show mixed results. Multy X and Orbi run about equal for the smaller filesizes, then Orbi wins with the 108 KB test and Multy X wins with the largest 759 KB file. Multy X was run through our Wi-Fi System test process, letting Multy X use whichever channels and bandwidth it chose. We've been seeing many Wi-Fi Systems use 40 MHz bandwidth in 2.4 GHz, which gives them an advantage in our process, which uses a clean RF environment with no neighboring networks. Multy X used 40 MHz in 2.4 GHz, same as Orbi.. Here's what Multy X looked like in the octoBox 18" test chamber. These benchmarks measure up and downlink 2.4 and 5 GHz throughput at each system node, by "walking" the octoScope Pal dual-band test client from node to node. Since tests are made with 0 dB attenuation between the Pal test client and each system node, all measurements are best case. The only exception is that all 2.4 GHz tests were made with 9 dB of attenuation between node and Pal client, to avoid overload. These tests are highly influenced by what's happening in the backhaul in each node. Focus on the 5 GHz results in particular, since from the RvR results, we know Multy X can deliver at least 500 Mbps on the root node with no backhaul involved. The 2.4 GHz downlink chart shows throughput measured at each node, with the A bars being the root node, B bars the Hop 1 node and C bars the Hop 1 node with 21 dB of attenuation set between client and Satellite, which is our standard practice when testing two-node systems. Multy X beats Orbi only on the Hop 1 tests, in both directions. But what's up with the Multy X Root node downlink test? The plot below shows what happened during the 70 second test that produced the Location A downlink results. It shows the throughput variation I referred to earlier. I ran this 12 test benchmark sequence multiple times and saw enough variation that I let the results stand so that this behavior would be reflected in the results and rankings. ...sometimes by a little, sometimes by a lot. Our Wi-Fi System capacity test uses three 2x2 AC clients, a 2.4 GHz client is connected to the root node and 5 GHz to the others. Since both Orbi and Multy X are two-node systems, both 5 GHz clients were connected to the second node. To avoid overload, 9 dB of attenuation was applied between the Pal and mode fot the 2.4 GHz Pal; 0 dB was used for both 5 GHz Pals. The Capacity bar chart shows total throughput for the three test clients in each direction. As I'd expect from a system with four-stream backhaul, Multy X does pretty well, placing up near the top of both charts. But it's interesting it places behind Linksys Velop, which has only two-stream backhaul, on uplink. Digging into the node level details shows Orbi with significantly higher throughput than Multy X.
Uplink shows Multy X with closest results to Orbi for Case C.
We can also see throughput changes over the course of the tests. The downlink plot once again shows variation in the 2.4 GHz test. It's also clear that throughput for both 5 GHz clients trends slowly down during the first 10 minutes of the test. Uplink is more interesting in that Root node throughput is significantly lower than downlink. Both 5 GHz clients have a lot of throughput variation throughout the 30 minute test run and also show slow falling and rising average trend lines. ...and uplink. The plots speak for themselves. When coming into the game this late, even top-tier companies need to present a compelling case to draw buyers from established leaders. This means better features, lower price, better performance or combinations of the three. Unfortunately, Zyxel, which is not a big name in retail consumer networking products, hasn't made the case on any of the three criteria. For features, it lacks support for Ethernet backhaul and, more importantly, multi-hop configurations, which Orbi now supports, albeit with some stability problems. Orbi now has significantly better parental controls with the recent addition of Circle with Disney; Multy X has only internet access scheduling. For performance, Multy X comes within striking distance of Orbi due to decent performance in its four-stream 5 GHz dedicated backhaul. But the stability problems I saw in the 2.4 GHz radio are troubling. And Orbi was much more stable than Multy X in the three-client capacity test. Finally, you're not going to save a lot by buying Multy X. At $300, Multy X doesn't present a strong case on price, given that you can usually pick an RBK50 Orbi up for about the same, if not slightly lower than that, as long as you're willing to wait out Amazon's dynamic pricing game. In the end, although Zyxel's Multy X outranked eight of the 11 Wi-Fi Systems we've tested, it has nothing that would make me recommend it over NETGEAR's RBK50 Orbi.